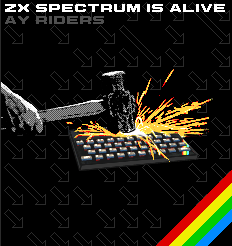 ay riders "zx spectrum is alive"
An EP released by 8bit Peoples. Contains 12 tunes. Tracks 1, 3, 4, 7, 10, 12 by Factor6; 2, 6, 9 by X-Agon; 5, 11 by Yerzmyey; 8 by Gasman.